And at o máximo is a quote that Goodluck has "prudently proposed that military salaries be raised and conditions improved." The National Post has a recap and some pointed quotes including "it’s worth noting African tyrants never stay home when a health crisis beckons". GidiNoize posts about THE REASON Yar’Adua has been unreachable and notes: "that Nigerian government officials and others interested in visiting ailing President Umaru Yar’Adua in Saudi Arabia could not do so because the Saudi Arabian royal family was in charge of his protocol and security arrangements". Well at least portions of the King Faisal Specialist Hospital & Research Centre have visiting hours. Hopefully Yar'Adua will find the hospital's online suggestion box to request permission for guests to visit him. 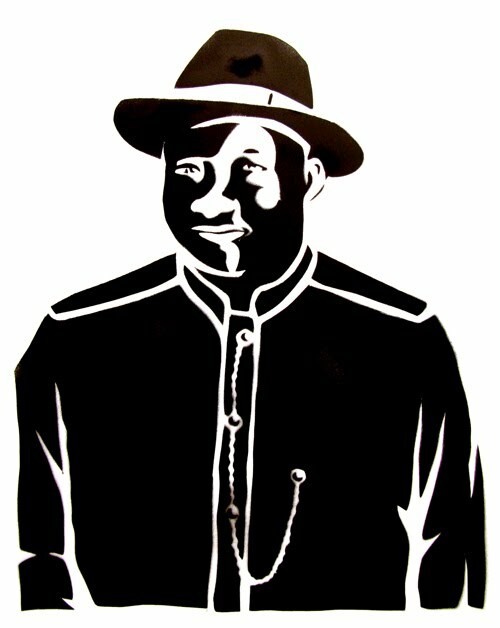 Regardless, here's a stencil of Goodluck Jonathan.